Published on June 14, 2016 in News. 0 Comments Tags: Apple TV, Big Bucket Software, iOS, The Incident. Retro-styled dodging game The Incident has been entertaining on iOS since 2010, but it still full of surprises. 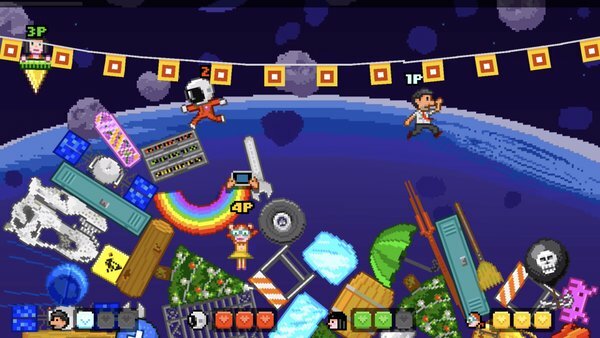 Developers Big Bucket Software have now brought the title to Apple TV, and expanded it to include ‘Coincidents’ mode so up to 4-Player can jump in. Run, dodge and jump your way to safety as an angry rain of just about everything in the world falls and builds a mountain of platforms for you to climb up, up… up to the source of it all: the cause of THE INCIDENT. You can start investigating The Incident over on iTunes now; to get playing on Apple TV, ready your Siri Remote, MFi compatible controller, or devices with the iOS version of the app and start dodging! Published on October 25, 2010 in General. 0 Comments Tags: Big Bucket Software, developers, directory, games, news, Silver Lightning Software, Super Furiou, The Incident, website. There are game developers in Perth? Really? That game was developed here? As a community, it can be pretty disheartening to feel so invisible. Shipping a game is a huge achievement that should be recognised, and our local game developers should be celebrated like the stars they are! That why Let’s Make Games maintains an directory of local game developers and keeps a record of locally developed games. If you haven’t yet seen our Games and Developers pages, check them out (and send us a profile if something is missing!). This bring our total listings to 27 games and 17 developers. Not too shabby for an apparently small industry! Published on August 27, 2010 in Events. 0 Comments Tags: Aranda Morrison, Big Bucket Software, Binary Space, Black Lab Games, eCentral TAFE, event, Gnomic Studios, Matt Comi, Paul Turbett, Saxon Druce. Description: Let’s Make Games has invited four local game developers (Matt Comi, Saxon Druce, Aranda Morrison, and Paul Turbett) to share their first-hand experiences developing and releasing games for various platforms (iPhone, Flash, Xbox360, Playstation 3, and PSP). We’re very excited to have such a great line-up of speakers talking about recently released games on multiple commercial platforms. 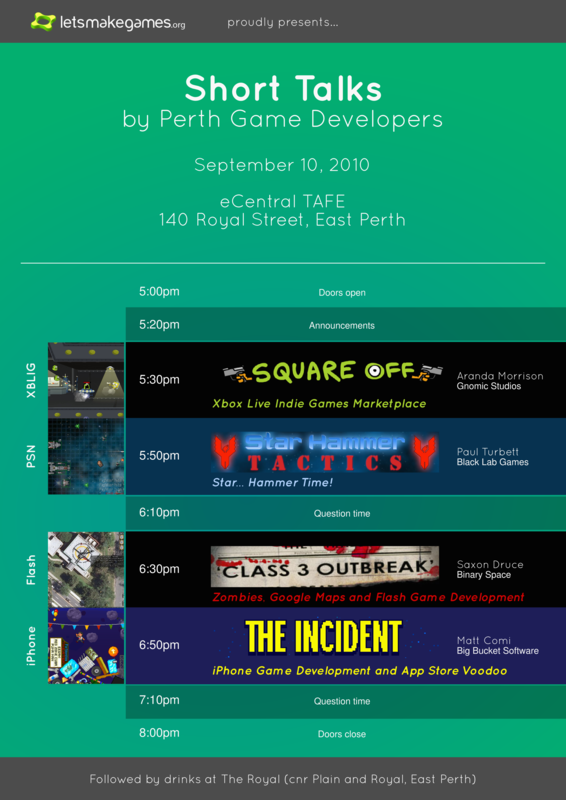 Perth game development has sure come a long way in the last few years! Update: If you are on Facebook, check out the Facebook page for this event. Update: Location updated with Room number (B202, the theatrette). We’ll be putting up signs and guiding people to the right place, but it’s nice to know the room number just in case! The Let's Make Games archives for the big-bucket-software tag.